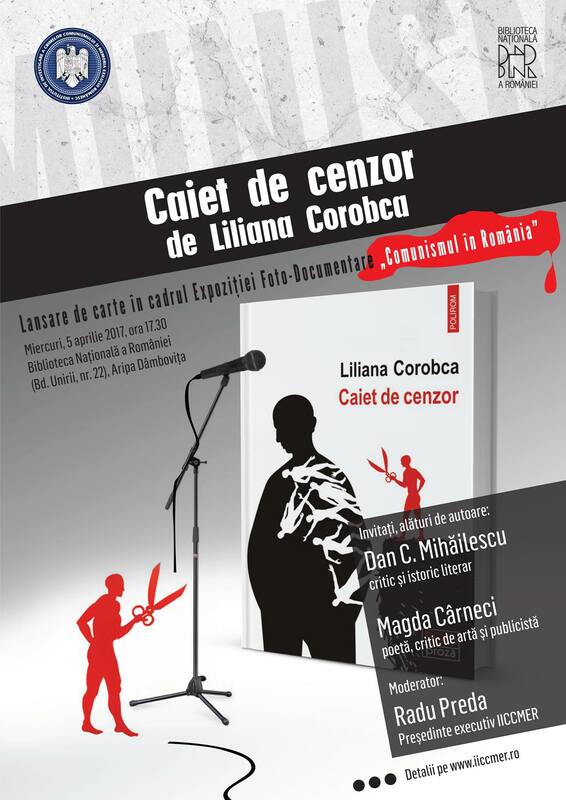 „Caietul de cenzor” se lansează miercuri, 5 aprilie 2017, de la ora 17:30, la Biblioteca Națională a României. 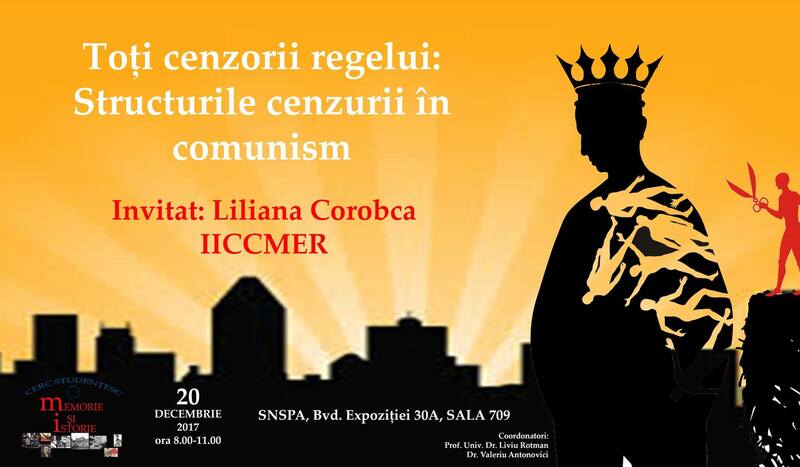 La eveniment vor lua cuvântul Dan C. Mihăilescu, critic şi istoric literar, Magda Cârneci, poetă, critic de artă şi publicistă, şi Radu Preda, Președinte executiv IICCMER (moderator). Instituția cenzurii comuniste în România (1949-1977), vol. I și II, de Liliana Corobca. O particularitate interesantă a Glavlitului bulgar în domeniul secretului de stat este acceptarea arbitrară a unor principii de secretizare. Menţionând faptul că, de-a lungul anilor, cenzura sovietică a acumulat noi mijloace de control, iar criteriile sovietice ale cenzurii erau lege incontestabilă pentru cenzura bulgară (directorul Glavlit, El. Gavrilova le acceptase cu fanatism), autoarea afirmă că Cervenkov, secretarul general al Partidului Comunist Bulgar, pretindea că intelighentzia bulgară, inclusiv partea ei marxistă, nu a crescut până la nivelul propriilor criterii. Dar aceste criterii nu se potriveau întodeauna cu realitatea bulgară, ajungându-se la situaţii ridicole, „de pildă, practica bulgară, urmând instrucţiunile din URSS, privind apărarea secretului în eventualitatea descoperirii petrolului” (Bulgaria nu are astfel de zăcăminte). Cred că ar fi foarte relevant pentru cazul românesc să se compare sistemele secretului din această perspectivă. In 1944, with the advance of the Soviet troops to the west, Soviet officers began to implement the Soviet system of censorship in all „liberated” countries. As a rule, this process has been made taking into account specific peculiarities of each country or the Soviet interest and this did not involved, as binding, the establishment everywhere of the Glavlit institutions. While existence of such state structure was possible only in the Communist regime (Nazis and democratic regimes have not known institutions like Glavlit), Communist system in some countries of the Soviet bloc has dispensed by services of this institutions, operating generally without cracks. Hungary, Yugoslavia and the German Democratic Republic, for example, did not have such institutions. But everything that is being published in these countries was supervised by special departments of the Central Committee and „all cultural institutions throughout the country, from the editorial offices of political journals to the publishing houses of children’s books, theatre managements, scientific as well as artistic institutions have the prime duty of exercising censorship. And those in leading posts at all levels know this and comply”. The abolition of censorship institution inBulgaria (1956) andRomania (1977) not coincided with the liberalization of their communist (censorship) system. Romanian censorship began its existence repeating or imitating the stages of Soviet censorship formation: banning and blocking the press (non-communist, opposition, ie nearly all media), purge of books, closure of the private bookstores or their nationalization, punitive measures against public figures etc. As in the Union of Soviet Socialist Republics, the books and media purge started in Romania before the official establishment of the institution of censorship, DGPT – General Department for Press and Publications (Romanian equivalent of the Soviet’s Glavlit). In 1949, when this institution was founded, it was already reaching the third wave of purges. What the USSR developed over decades (eg books purge), was made in only a few years in Romania. Soviet indications were very accurate because of their vast experience. The period of 1944-1949 is little known and it is almost inaccessible due to the total or partial lack of documents (there is not in Romania any archival background about the Allied Control Commission, par example). Therefore, we paid particular attention to this time period. The first major action of censorship was the purge of books and effective controls of all publications. But these tasks were performed either in the early years or have been passed into the responsibility of other institutions (the advance control of publications will be conducted by the publishers and editors, for example). In the Soviet Union, censorship, as an independent organization, was formed on 6 June 1922, having been called „General Department of Literature and Publications” (Glavlit), a subordinate institution of the People’s Committee of Education (Narkompros). In 1933, when the Glavlit evolved, it was subordinate directly to the Council of Ministers of the Soviet Union and changed their name „Main Administration for Safeguarding State Secret in the Press”. 1. Romanian Communist Party, with an old tradition of conspiracy, illegal activity, maintained and developed a real „mania for secrecy”. This is explained by communist ideology itself which put in the center of human existence the class struggle, confrontation between the proletariat and its multiple class enemies. The appeal for „revolutionary vigilance” against „inside and outside” enemies was ubiquitous in the speeches of communist party leaders. 2. Soviet Union’s influence is not at all negligible: „Soviet officials were the main factors that have established data constituting state secrets for all Eastern bloc”. The main state structures, formed after the Soviet model and with the help of the Soviet specialists, have inherited also the Soviet system for safeguarding the secrecy. Since its establishment in 1948, the mission of „Securitatea” (romanian security organs) was: „the defense of democratic gains and assurance of security in Romanian People’s Republic against the conspiracy of internal and external enemies.” In Bulgaria, for example, „The List of state secrets has been elaborated by a commission consisting of El. Gavrilova, V. Katishev, officials of the State Security, and of the Ministry of National Defense”, Viktor Katishev being the deputy director of Soviet Glavlit . In the communist regime, the censorship was not exercised only by DGPT- the censorship institution. There were “editorial censorship”, effectuated by employees of magazines, publishing houses, radios and televisions, etc. ; the “repressive censorship” executed by the political department (political control) of the security organizations; ideological censorship, effectuated by party leadership, which had the first and last word in why and how it should appear or be banned (The party gave indications to the DGPT); the „inside” censorship which caused authors to guess the ideological, aesthetic, political regulations of his work over numerous stages of the control. But the main institution of censorship exercised the most important and the largest operations of censorship and control. An army of censors was actually in charge of the whole process of banning, discovering the authors, information, „anti-Soviet” and harmful works. In Soviet Union, Glavlit disappeared with the collapse of the communist regime. The abolition of that institution decided by Nicolae Ceauşescu in 1977 is an essential moment in the evolution of the censorship inRomania and we found documents regarding the last years of this institution. I tried to reconstruct the activity of censorship institution, step by step, looking for documents in the fund “Committee for Press and Publications”, of the Central Historical National Archives. A timeline of the documents was irrelevant because there are years in which the important documents about the funding of censorship are poor. Therefore, I propose a thematic classification of the fund. Like pieces in a comprehensive puzzle, the 106 documents from volume I are arranged, chronologically, into two thematic chapters: 1. Structure, attributions; 2. The activity of censorship departments. Volume II contains three parts: 1. Relations DGPT (CPT) with other institutions; 2. Direction Control-Training. Centre-Province relation; 3. The censor. Main character (191 documents). 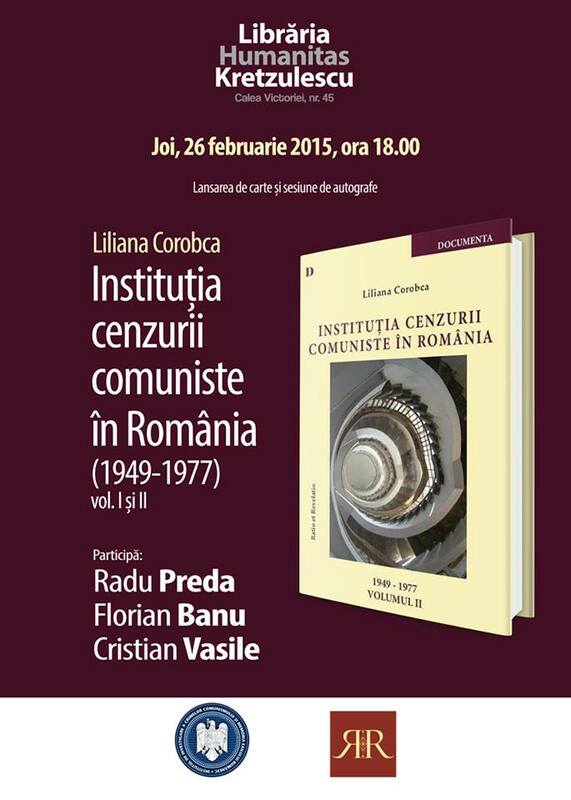 Some important issues are discussed in the foreword „Censorship mechanisms in the communist regime in Romania” (vol. I) and afterword „State secret and censorship institution” (vol. II). Pierre Kende, Censorship in Hungary, Dušan Havliček, Public information in the soviet political systems, Research project, Crises in Soviet-type systems, Study No. 9, Koeln, 1985, p. 44. We’ve put together a volume of documents refering the activity of censorship during the first period: Epurarea cărţilor în România. Documente (1944-1964), (The Purge of books in Romania), edition, preface and notes by Liliana Corobca, Bucureşti, Ed. Tritonic, Bucureşti, 2010. Florian Banu, „Secretul de stat în România populară sau despre societatea ermetică” (The state secret in popular Romania or about the hermetic society), in Dosarele Istoriei, no. 10(86)/2003, („Buletin C.N.S.A.S.”, no. 4), p. 52. Vesela Chichovska, „Glavlit (1952-1956). Izgrazhdane na edinna cenzurna sistema v Bulgarija” (Establishment of unique system of censorship in Bulgaria) in Istoricheski pregled, 1991, knizhka 10, p. 52. Florian Banu, op. cit., p. 52. The leader of Bulgarian Glavlit. Vesela Chichovska, op. cit. p. 52. Romanian Central Historical National Archives (ANIC), Fund „Press and Publications Committee” (CPT), file 13.1950, tab 57. ANIC, CPT, file 22.1952, tabs 38-40. ANIC, CPT, f. 10.1949, t. 18. Ibidem, f. 4.1955, t. 45. ● Instituţia cenzurii comuniste în România, 1949-1977. Documente. Vol. 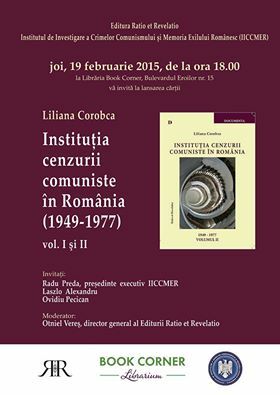 I-II (Communist Censorship Institution in Romania), forthcoming. The goal of the conference is to unite scientific societies of historians and lawyers for studying relevant and ill developed issues of judicial science and history of state and law, developing new knowledge and sharing experience. Conference allows postal participation. Conference application form and article matters should be sent to the e-mail not later than April 1, 2012. Application form must contain: the title of the report; first name, second name and surname of the author; academic degree and rank, position; full name of the organization they represent. ; address where the conference book should be sent, telephone, e-mail of the author; participation form (live/postal). Works, published in this international conference are equal to the work publications in major reviewed scientific journals and publications, which reflect the main scientific results of dissertation. Organizing committee reserves the right to pick out the articles for publication in the “Leningrad judicial magazine” (recommended by the HAC – Higher Attestation Commission – for the publications in “Science of law” subject). The cost of 1 article publication: 1 page – 200 RUB (5 EUR). Size of the article is from 5 to 10 pages. Norms of work appearance are according to government standart. Word, line spacing 1. Payment receipt (with account details ofPushkinLeningradStateUniversity) is sent to the author together with the confirmation, that the article is accepted to be printed. Acum răsfoiești arhivele pentru categoria secretul de stat.